The Accidental Locavore has been in the middle of judging for Toque’s 2011 Food App Awards, so make sure you check in on December 8th to see who the winners are. In the meantime, I’ve been taking Michael Rhulman’s Ratio for a spin. My father and others I know are crazy about the book this app is based on, but since I don’t own the book, the Locavore can’t really say whether the app is better than the book or vice-versa. The idea behind both is that most food preparation falls into certain ratios. Once you know what the rules (ratios) are, you’re free to mess around with the ingredients. So if you want to make cookies, it’s helpful to know that it’s 1 part sugar to 2 parts fat to 3 parts flour. 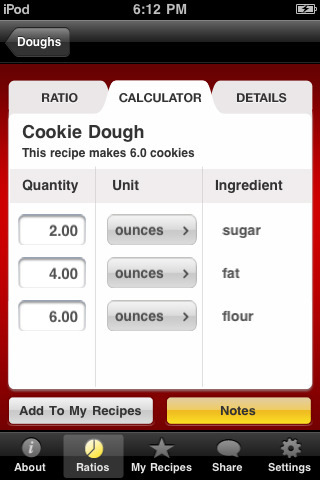 What’s not helpful is that the default number of cookies you’ll be making is 6. Now, when was the last time you broke out the mixer to make 6 cookies? To up the number of cookies, there’s no way to change it to 24 cookies, you can only do that by changing one of the ratio ingredients (8 ounces of sugar will give you 24 cookies according to this). Another issue is how to figure out how many egg yolks there are in 6 ounces (hollandaise sauce). Do you know? The app lacks a measurement option for units (like yolks). There are all the usual options like saving your favorites, making notes, and of course, sharing on Facebook or email (does anyone actually do that?). Just in time for Thanksgiving, the Accidental Locavore discovered Time to Roast. It’s a great little app that does one thing and does it well. When you want to roast meat or poultry (and you have to love that it includes duck and goose! ), it does the math for you. After you load it, you set up the time it takes your oven to heat up (mine’s slooooww), what type of oven it is, weight in pounds or metric, temp in centigrade or Fahrenheit. That’s it. When you’re planning a dinner, simply plug in the type and weight of your roast, how well done you want it, when you want to serve it and voila, it tells you when (and if needed, how) to start. 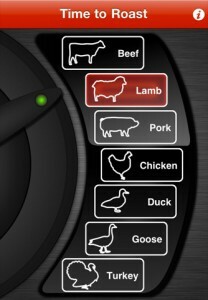 Along the way, (loud) alarms go off to tell you when your oven has heated up, the roast is cooked, resting times, etc. If you just want to pop the bird in right now, it will ask if your oven is preheated and depending on your response, give you the proper timetable (and alarms). A very efficient little app! If that’s not good enough, their support people got back to me so quickly when I commented on a feature I couldn’t find–kudos to them! Cook’s Illustrated is a standard recipe app with a pretty large collection of recipes, grouped in alphabetical order, so desserts are the third thing on the list. If you’re not a member, you get about 10 recipes for free in each category. What makes these recipes a little different is that each one comes with the obsessive/compulsive explanation of the issues surrounding each and every dish. Once those hurdles are (successfully) overcome, the recipes are pretty straightforward. Two attractive features are the ability to add ingredients to a shopping list, and a built-in timer that you can set to time various stages of a recipe. 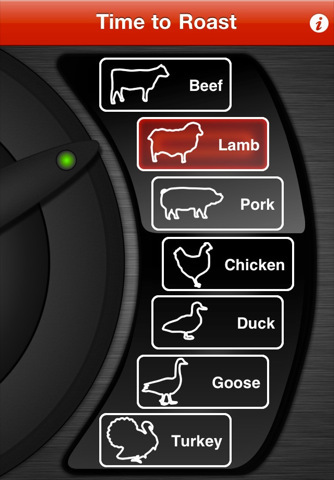 Now I’m not sure how much I want to be setting and resetting my iPhone while I’m browning chicken, but it’s there if you need it. Another feature is their rating of various food products under “Taste Tests”. If you need to know what the best potato chip is, this is your app. Unfortunately, there is no telling when these taste tests were conducted, so products may or may not be the same as when they were rated. As with the recipes, there’s a detailed explanation as to the issues surrounding say, jarred salsa. Downsides? You’re better off if you’re into the Cook’s Illustrated too-much-information mindset. The search engine is a little weird, returning everything but onion soup, when the Locavore searched for onion soup. It’s only an iPhone app, so you can’t take advantage of the screen size of an iPad. And today, the biggest downside? You can’t download it from the American app store, although the Cook’s Illustrated website has a link. For all the complaining about poorly created apps the Accidental Locavore has done recently, finally a good one about food! Maybe it’s because Jamie Oliver is a celebrity chef, so there’s lots of development money behind him, but Jamie Oliver’s Recipes has all the bells and whistles so many others are lacking. And happily, the Locavore picked up a great idea from the Sausage and Zucchini Carbonara recipe; take the Italian sausage out of its casing and make it into mini-meatballs (who doesn’t prefer a meatball?). There are a couple of recipes in the tasting pack that you might have to be British to want to make, but most of them seem interesting and accessible. I’m definitely taking the lamb shank and fish stew recipes out for a test run. Then my first purchase might be the tray baked collection, a mix of one-dish dinners. Another great feature (for many of the recipes) is that by touching the screen, you can easily change the quantity of the recipe to feed 2, 4 or 6 — super convenient for those of us whose math skills can occasionally be challenged. 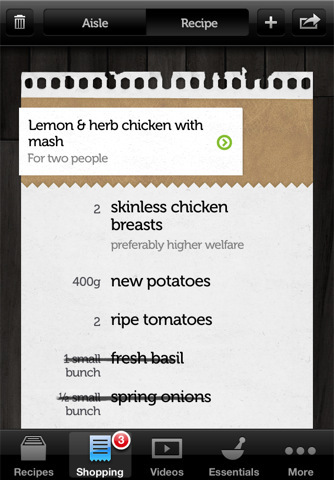 When you’ve picked a recipe, Jamie gives you the option of sending all the ingredients to a shopping list. Then you can go to the list and cross out the ingredients you already have, or add other items, and email the completed list to yourself or whoever you can con into grocery shopping. It’s grouped into aisles, so you’re not doing laps around the store, another great idea! My only complaint, the video download on knife skills seemed to take a long time, but that may have just been my connection. Once downloaded, it’s a very useful video on basic cutting techniques, with an emphasis on not cutting anything attached to your body…always a good idea! The photography is good, the food looks appetizing and accessible, not too fussy and Jamie always has you set the table. If you can’t find a dish by the well-organized categories, there’s a search engine. 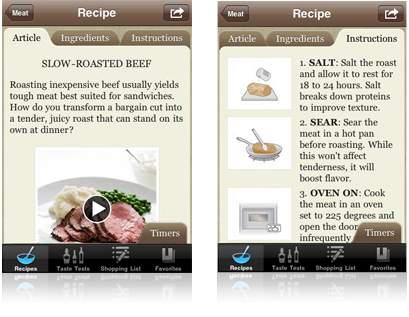 All in all this is the best food/cooking/recipe app I’ve seen so far.